To be fair, the real purpose of the proposal is to study the technical challenges of building a the next generation machine. The ironic thing is that most of the technical problems, like designing powerful magnets and sensitive detectors are surmountable. The logistical problems, like digging a 100 km long tunnel underneath Chicagoland, are a bit tougher. Why so big? Every time a charged particle changes direction, it loses a little bit of energy to synchrotron radiation. The faster it's moving, the more turns it takes around a circular track and compounding the energy loss. By making the curve of the particle's path as gradual as possible by building these enormous rings, it reduces how much energy the particle loses. The more energy two particles have when they smash into each other, the more scientists can pick apart their remains looking for exotic physics. The LHC found the Higgs boson pretty quickly and already physicists are crossing their fingers, hoping to find hints of much heavier supersymetric particles or extra dimensions. However the heavier a particle is, the more energetic collisions will be needed to produce it. Eventually scientists will learn all they can from this machine and start looking towards an even bigger and more powerful device. It brings us to one of the big problems high energy physicists are running into. The best tools we have today to probe deep into the nature of matter are particle accelerators but they're already gigantic and expensive. The LHC is 27 km around and cost roughly $9 billion to build. It's not easy keeping people excited about projects like these long enough to complete them. In the 1980s and early 90s the Unites States started building the Superconducting Supercollider in Texas, which would have been 87 km around. But as the cost of the giant experiment ballooned, Congress cut off funding in 1993, leaving behind nothing but empty buildings. 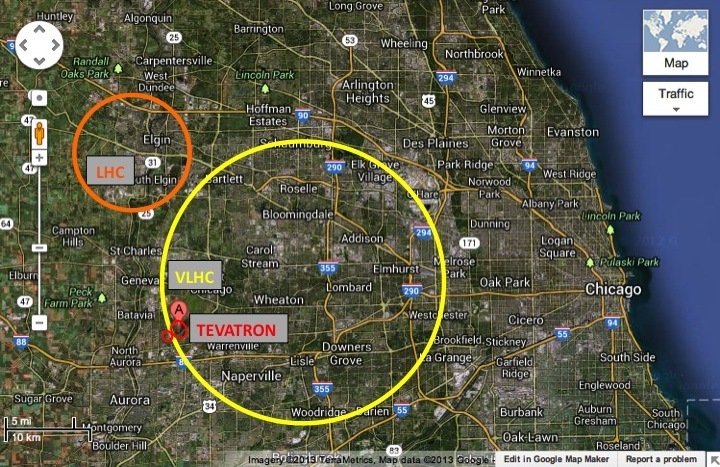 The Snowmass design of the VLHC would smash particles together at about 100 TeV, and create Higgs bosons by the truckload. Still though this design is a bit more modest than a 2001 design. That one had 233 km of tunnels! Time to build the one around Earth to start with.